Hardly a recipe at all really, but it’s good so I thought it was worth sharing. If you’re one of those people who find sweet potatoes too … well … sweet, then you might enjoy the way the lemon gives them a somewhat sharper edge. I’ve used hot smoked paprika as the spice, but you could try a combination of cumin, coriander and cayenne or substitute sweet paprika for a gentler flavour. Cut them into chips if you prefer. Whatever tickles your taste buds and fancy. We ate them with veggie burgers but for meat eaters, they’re good with sausages, chicken, chops, steaks … anything fairly straightforward you’d like to poke up a little. 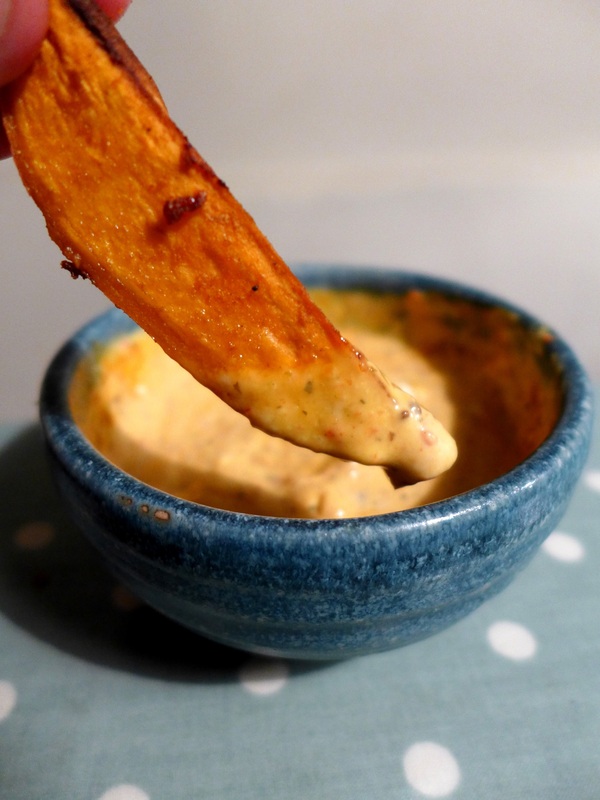 A spicy mayo for dunking is a welcome addition. Harissa mixed into Hellmans is an easy fix. Mix the oil, lemon zest and juice, paprika, garlic, salt and pepper in a large bowl. 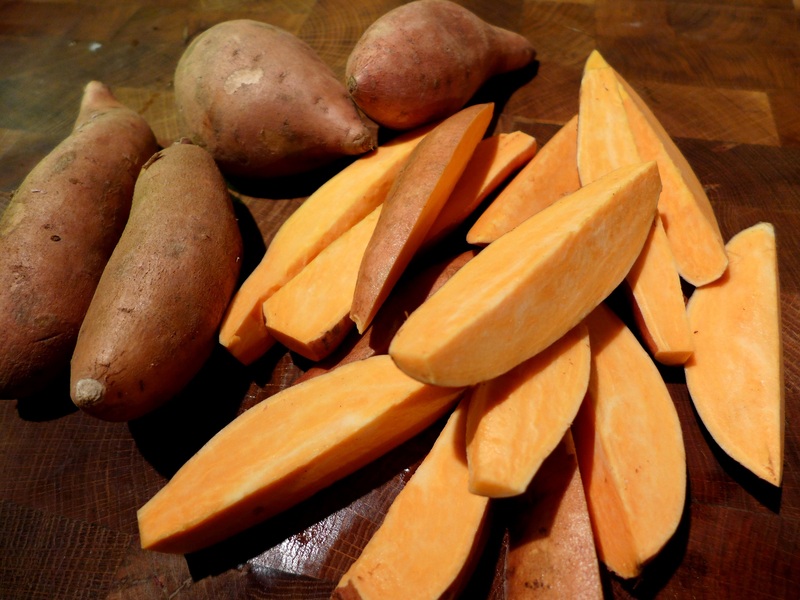 Scrub the sweet potatoes, trim the ends and any hairy bits, but don’t peel them. Cut into thick wedges. I quartered the thinner ones and cut the fatter ones into six. Toss the wedges in the spicy oil and put them in a roasting tin, skin side down. Spoon over any remaining marinade. Cook for 30-40 minutes or until the flesh is soft and toasty and the skins have crisped up a bit. This entry was posted in Vegetables and salads, Vegetarian and tagged spicy sweet potato wedges, spicy sweet potatoes by Linda Duffin. Bookmark the permalink. Have you tried tossing them in oil, garlic and a spoonful of tandoori mix? That’s good too. Actually, it’s hard to persuade Him Indoors to eat them any other way. But I shall definitely try this on him. One of my favourite ways to cook veg, though looking at your suggestions, I must get more adventurous with the spices. I love roasted root veg, it seems to concentrate their flavour. And it’s always fun to experiment with spices! Thanks for taking the time to comment. L.
These sound delicious…I love the combination of sweet and spicy, and the lemon juice is a great idea! I make a spiced roasted root vegie salad which is delish hot or cold. 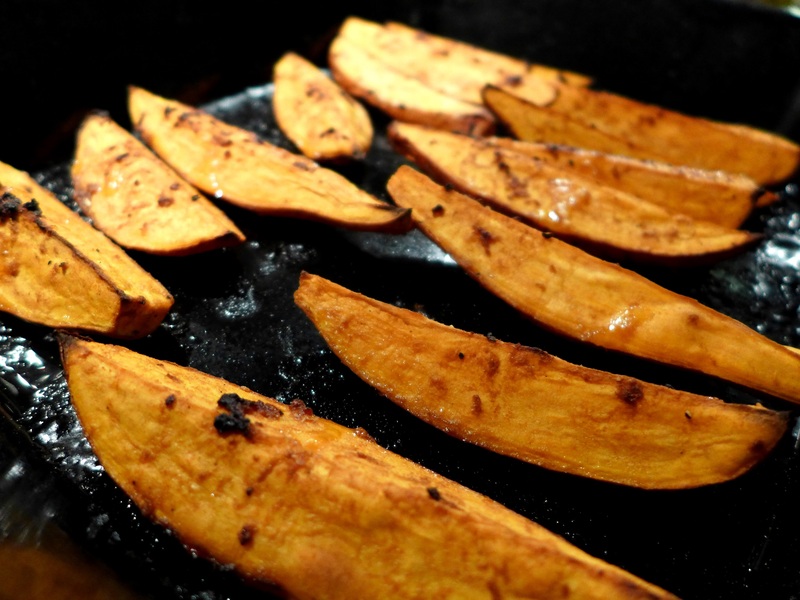 Your sweet potato wedges remind me of that, yum! I have yet to make these on my own, and I have no idea why! Sweet potatoes are the best! Great recipe. Oh, I’ll definitely be making these, Linda. Love roasting sweet spuds and your method will bring new flavors to the party. Thanks!